Premium Classic High Performance Semi-Gloss Acrylic Latex is a super premium interior wall finish for use where better washability and stain resistance compared to conventional interior latex coatings is required. This product features superior flow and leveling application properties. The low odour fast dry formula is ideal for use on all interior walls and trim including drywall, plaster, masonry and primed wood. 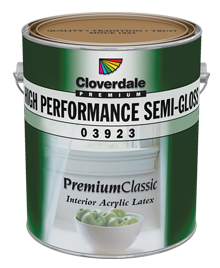 Premium Classic High Performance Semi Gloss Acrylic offers excellent interior durability, hardness, scrubbability and adhesion. This product is ideally suited for where a higher performance level is desired.